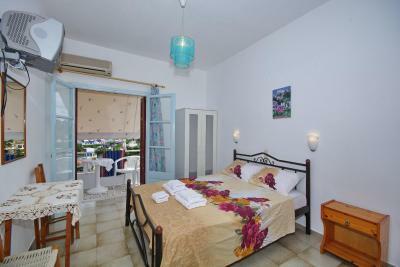 Lock in a great price for Nikos Rooms – rated 8.6 by recent guests! A beautiful place. The hosting couple are very nice, caring, hardworking people. I wish them good luck in everything they will aim to do. Upon arriving at the port, I was met by the owner, Niko's who brought me to the pension. Room was bright, spotless, and comfy with a fantastic view of Votsi beach/harbor. 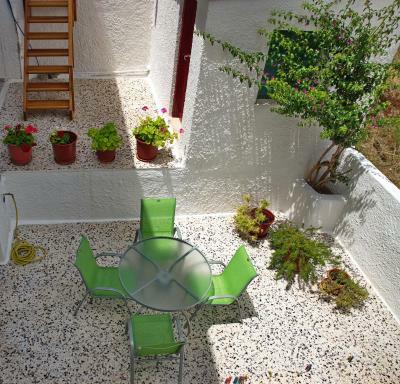 Beautiful yard to enjoy shaded outdoor space and a small kitchen building where you can cook simple meals. Hot water was dependable. Niko's and his wife were always available if you needed them and made you feel like you were staying with family. 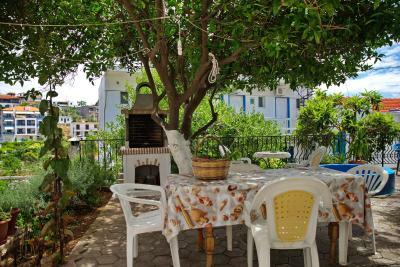 Niko's rooms are short walk to the beach, Demitris restaurant and the Academy (IACH). Everything was fine. Very friendly host, clean rooms. 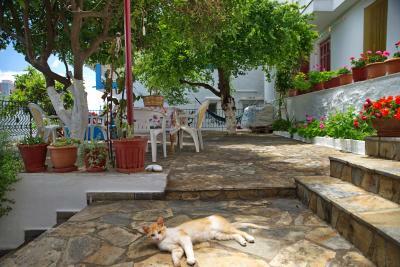 We had a totally good stay on Alonissos. 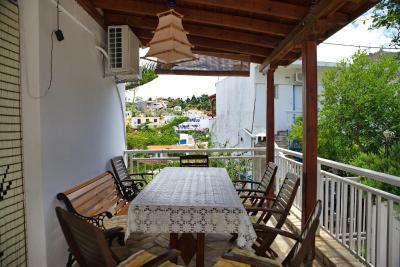 We spent 6 days at Nikos Rooms in Votsi and it was a really nice experience! Mr Nikos himself, a really polite and pleasant man, met us at the port when we arrived and drove us to the facilities. The room was very clean, provided everything we needed, and the place was really quiet and only a matter of minutes drive to the most popular beaches. 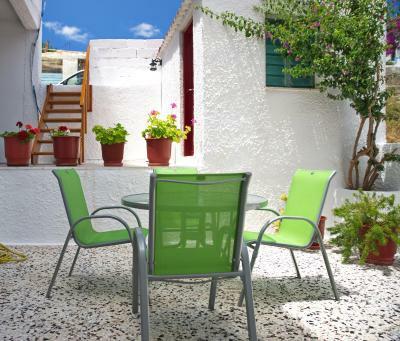 We had an overall great stay there and would totally recommend Nikos Rooms! great view, very clean and tidy. Friendly staff and great location! Mr Nikos picked us up from the port and took us to our room which had great view, was near the sea and in general wes awesome. 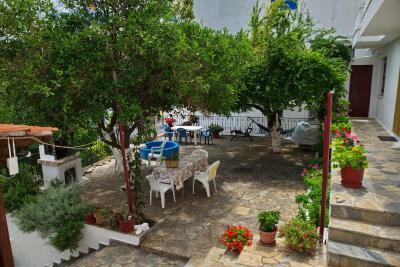 Quiet and peacefull location, with some taverns nearby and great access to many nearby places to swim. Keep in mind that in Alonnisos there are many steep climbs and the roads are a bit tricky but nothing too much! Nikos was very friendly and very responsive to our requests. We appreciated especially that the room was cleaned every day. Thank you! 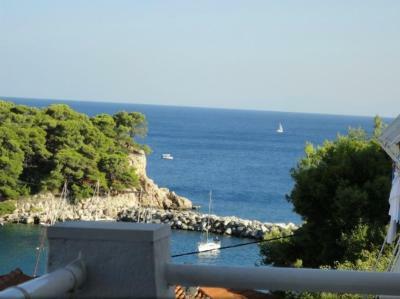 The property is in a very quiet location overlooking the charming port of Votsi. It has a sea view from the balcony. There is a supermarket within a few hundred yards. I took some nice walks including to the must see ancient archaeological site of Tsoukalia overlooking the Aegean in a peaceful cove plus also to the church on the commanding heights at Agii Anargiri with superlative distant views towards the Greek mainland. 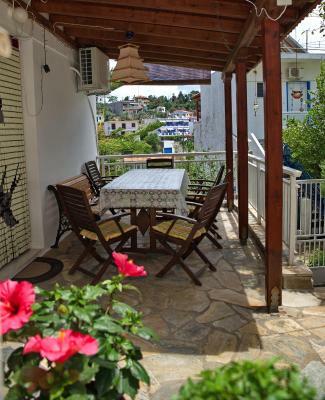 There are a number of good restaurants and tavernas within easy walking distance. 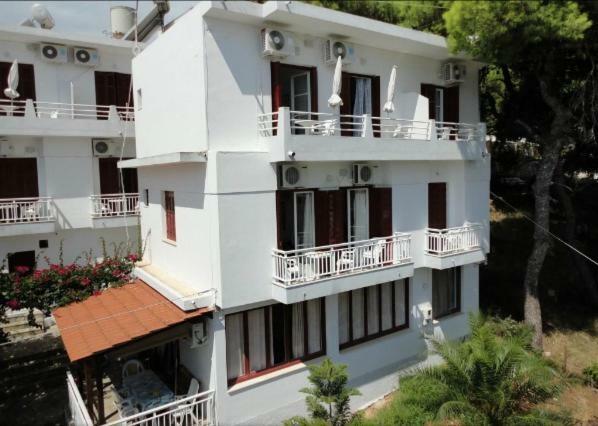 We spent 20 days at Nikos Rooms in Votsi and it was a really nice experience! The room was very clean, provided everything we needed, and the place was really quiet and only a matter of minutes drive to the most popular beaches. 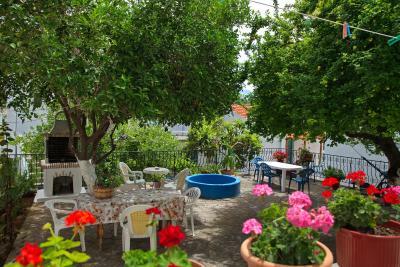 We had an overall great stay there and would totally recommend Nikos Room. Nikos and his wife Irina were very friendly and very responsive to our requests. We appreciated especially that the room was cleaned every day. Thank you! 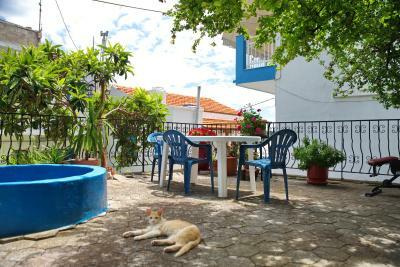 Good room, comfortable bed, great value for money, quiet place, 20min by foot to Patitiri. Отличное расположение, рядом два пляжа (Вотси и Рузуми), недалеко два продуктовых магазина, несколько кафе и ресторанов. Окна большинства номеров смотрят на восток, благодаря чему в номере и на балконе не жарко, в этом месте отелей с таким хорошим расположением мало. Есть кухня и возможность самостоятельно приготовить еду, уютные столики для обедов и ужинов, кровати отличные. Хозяева очень приветливые и говорят на многих языках, включая русский. 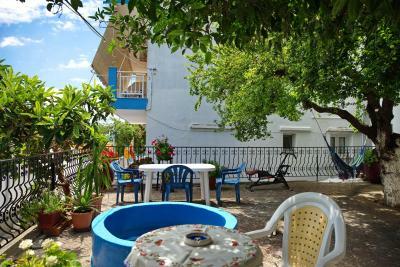 The family-run Nikos Rooms is located in Votsi Village of Alonissos, just 150 feet from the beach and a short walk from taverns and cafés. 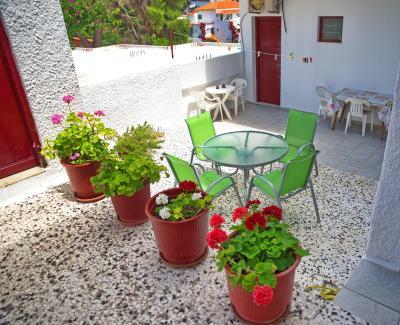 It offers a blossomed sun terrace with BBQ facilities and rooms with free Wi-Fi and a balcony. 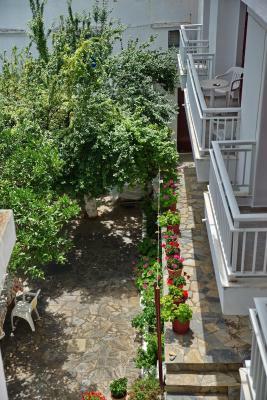 Enjoying views over the garden or the Aegean Sea, all rooms of Nikos are air conditioned and heated. 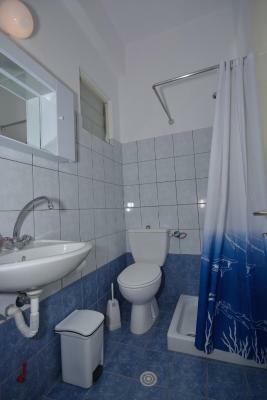 Each unit is equipped with a fridge, a TV and a private bathroom with shower. BBQ facilities and free shuttle services from the port are provided. 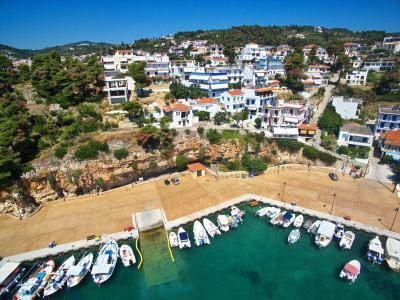 Guests may participate in the boat trips organized by Nikos Rooms. 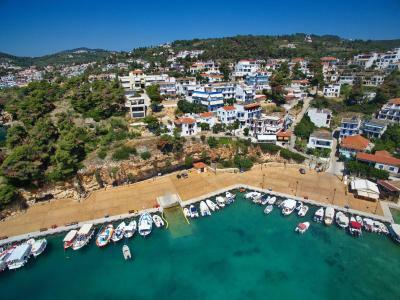 Patitiri Port lies within 1.2 mi from Nikos Rooms, while the scenic Alonissos Town is at 2.2 mi. Guests will find the sandy Chryssi Milia Beach at 1.6 mi and Marpunta Resort at 2.5 mi. Free private parking is possible on site. This is our guests' favorite part of Votsi, according to independent reviews. 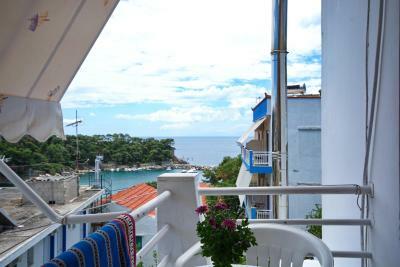 뀐 Located in the top-rated area in Votsi, this property has an excellent location score of 8.8! When would you like to stay at Nikos Rooms? Overlooking the Aegean Sea or the garden from its balcony, this air-conditioned room offers free Wi-Fi access. 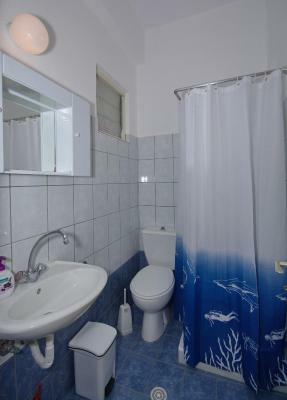 It features a fridge, a TV and a private bathroom with shower. House Rules Nikos Rooms takes special requests – add in the next step! Nikos Rooms accepts these cards and reserves the right to temporarily hold an amount prior to arrival. In case guests are interested in using the free shuttle services from the port, please let Nikos Rooms know your expected arrival time in advance. You can use the Special Requests box when booking or contact the property. The local beach could be better by far. But there is a useful shuttle bus which carries tourists to three different lovely beaches, so it's not a big problem at all. Still, the local authorities should put some extra effort in the near future to better the conditions and so give these honest, hardworking people a chance to have more guests and earn better money. They do deserve it. The tent outside our room was shared with the room next door so we had to communicate with our neighbours to lift it up and bring it down. Not much of a hassle anyways! The room had an air conditioning unit but I didn't attempt to use it and didn't see the remote control. That's more a reflection on my lack of initiative. I had wanted to pay by card but Nikos said that was not possible (card machine not ready?) and so I paid cash. This depleted my reserves and impacted my cash position somewhat.